Bernie Sanders’ theory of change isn’t serious: The Vermont senator’s “political revolution” isn’t going to happen. 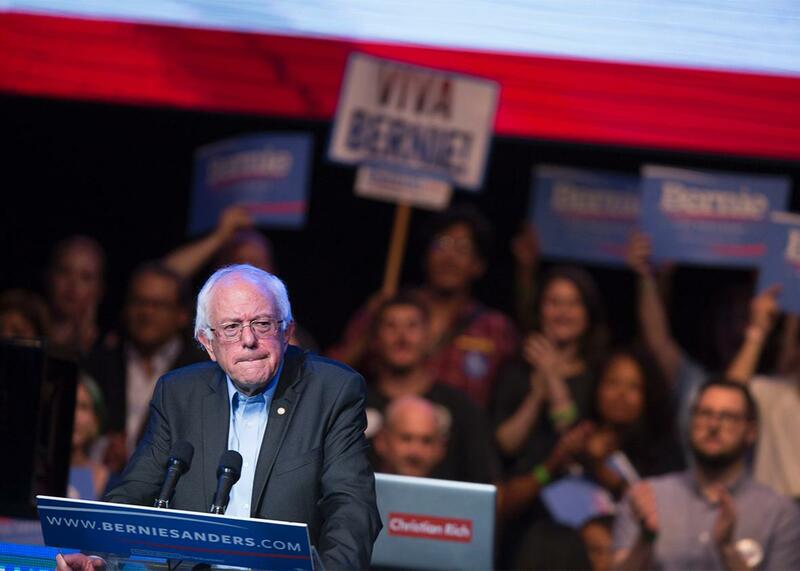 Bernie Sanders is an inspirational candidate, but his theory of change doesn’t have a chance. Democratic presidential candidate U.S. Sen. Bernie Sanders speaks at a campaign fundraising reception, Oct. 14, 2015, in Los Angeles. “Now, in my view, the only way we can take on the right-wing Republicans who are, by the way, I hope will not continue to control the Senate and the House when one of us [is] elected president,” he said at Tuesday’s presidential debate. “But the only way we can get things done is by having millions of people coming together.” Sanders will build so much enthusiasm and inspire so many voters that he’ll come to office with the votes he needs to pursue his plans. But there’s a problem. We’ve seen this story before. Barack Obama entered office on a Democratic wave. He won a strong majority of the popular vote—flipping Republican states like Indiana and North Carolina—and helped Democrats win 255 seats in the House of Representatives and 56 seats in the Senate. With a sure mandate and a largely unified party, Obama was primed for success. And he got it, sort of. Over two years, Congress passed an ambitious stimulus package, health care reform, financial reform, and a bevy of smaller measures, from the Lilly Ledbetter Fair Pay Act to a bill to reduce the crack and cocaine sentencing disparity. At the same time, this was a slog. Despite an economic crisis and a supportive public, Obama couldn’t win Republican support for major policies. Just three Republicans crossed the aisle to vote for the stimulus, and one of them switched parties in the face of a backlash from GOP voters in his state. Without Republican support—and facing filibusters at every turn—Obama had to corral every Democrat, which gave leverage to centrist and conservative Democrats like Sens. Joe Lieberman, Ben Nelson, and Evan Bayh. It’s how we got the “Cornhusker kickback” (which was later removed from the bill). It didn’t matter that party voters were behind Obama and his priorities; if the White House didn’t accommodate every Democrat, its agenda would stumble and fall. And even after Democrats won 60 seats—Al Franken entered the Senate in the summer of 2009—the challenge remained. We can criticize Obama for everything he didn’t do as a legislative leader, but the truth is that his plans were steered, in large part, by the right flank of the Democratic Party. Put differently, President Obama entered office under the best circumstances for any Democrat since Lyndon Johnson won a landslide in the 1964 presidential election. Yet his core priorities nearly crashed on the rocks of Republican opposition and political venality. On Thursday, I argued that both Hillary Clinton and Sanders need to give plans for executive branch action, given gridlock in Congress. In response, on Twitter, some Sanders supporters said this was wrong: That Sanders—with a long career in lawmaking—could win Republican support; that Sanders would use the bully pulpit to rally voters; and that a Sanders win would necessarily bring the kind of wave that would give him votes for his policies. But this is blind to reality. Compromise is a distant shore. The Democratic Party has moved to the left, and the Republican Party has made a sharp turn to the right, guided by two generations of conservative revolutionaries, from Newt Gingrich to the Tea Party tidal wave of 2010. If you watched the Republican and Democratic debates back to back, you’d be forgiven for thinking they described two different countries. What’s more, as demonstrated by the GOP presidential race—as well as the leadership fracas in the House of Representatives—many Republicans (57 percent, according to the Pew Research Center) reject compromise full stop. The world where Donald Trump and Ben Carson lead the GOP presidential race is not a world where Republican voters would support a Democratic president or assent to his policies. The presidency is polarizing. When you step onto its field, you become a polarized figure. Indeed, the “bully pulpit” does more to tear people apart than bring them together. For all of his legislative success, President Sanders would be just as divisive as President Obama, who was just as divisive as President Bill Clinton. You can’t avoid this; it is baked into the cake of ideological politics. Conservatives are just as sincere with their beliefs as liberals. And they’ll reject a Sanders agenda in the same way that liberals would reject Sen. Ted’s Cruz’s plans. If compromise is off the table, then what about the “political revolution?” It’s possible. Sanders might bring a wave of new voters to the polls and secure Congress for Democrats. But as we saw with Obama, this gives you nothing in particular. The Democratic Party contains the vast majority of America’s liberals, but it isn’t a liberal party. It is a coalition of different groups and interests, from civil rights organizations and labor unions to banks, businesses, and countless voters spanning a massive country of distinct regions and areas. Sometimes, they hit the same notes and play the same song. But more often, they’re discordant. There’s no guarantee that a group of senators from states as different as New York, Massachusetts, Florida, North Carolina, and West Virginia will agree to vote with Sanders on breaking banks and creating free college education. Not because they’re in league with oligarchs but because people—even people on the same side—disagree, and those people get a major say in how we run government. What happens to a Sanders agenda if he doesn’t have a Democratic Congress? What happens if he has one but has to compromise to the bone to win? What happens if it fails? Sanders is a remarkable candidate who has inspired a lot of people to get involved and change the country. He’s the first socialist to gain traction in national politics since the first half of the 20th century, and he disrupts the narrow scope for ideological debate in the United States. But he’s also a politician, subject to the same forces as his peers, and neither he nor his allies can ignore the structural realities of American politics. If Sanders wants to be president, he needs a serious theory of change. Otherwise he’ll flail—and he’ll fail—and his supporters will wonder what happened.